One of the more popular characters to come out of the Clone Wars era is the Sith wannabe, Asajj Ventress. She was featured prominently in both the 2003 and 2008 series of Clone Wars cartoons and in Dark Horse comics. She is also set to star in a new Del Rey book, Star Wars: Dark Disciple in 2015. 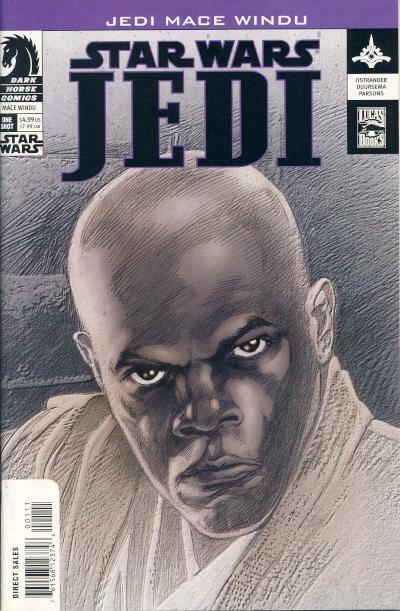 Her first appearance in comics is in the one-shot, Star Wars: Jedi - Mace Windu. Interestingly, there are several listings of this comic on eBay which are asking for $30 or more. This comic usually sells for $4 - 6. Why the discrepancy between what sellers are asking and what the comic actually sells for? 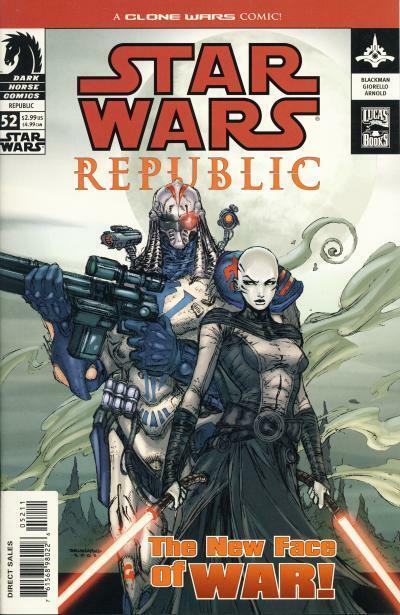 There was a rumor that Asajj Ventress is the villain in Star Wars Episode VII earlier this year which is looking more and more unlikely, but TV and movie rumors are a big factor right now in comic book prices. It is doubtful a copy has ever sold for $30 on eBay, let alone the $85 that MyComicShop is asking, but that does not stop enterprising individuals from attempting to capitalize on the latest TV and movie rumors. 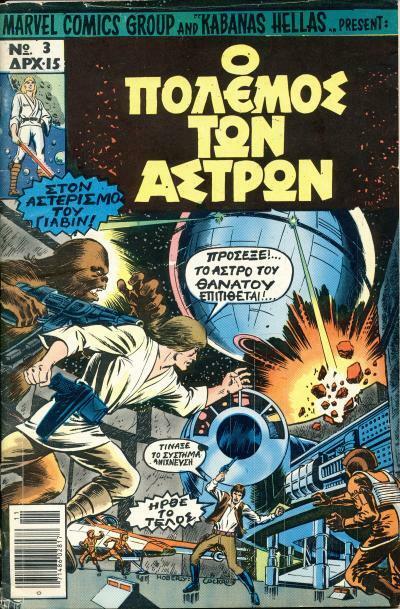 The country of Greece contained a small population of over 9.3 million people in 1977 (compared to the U.S. which had a population of over 220.2 million people) but had 2 publishers translate the Marvel Star Wars movie adaptation. 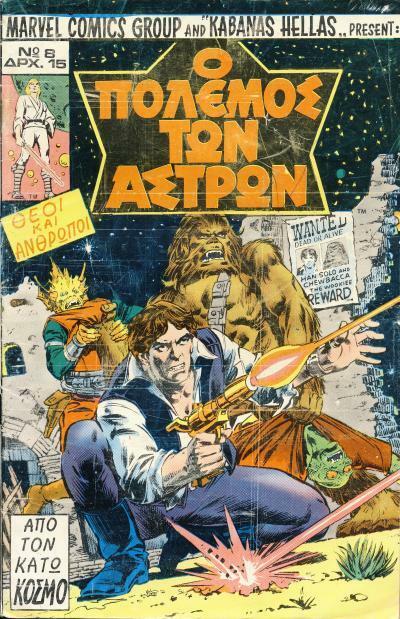 The first publisher was Kabanas Hellas which was in the business of publishing Marvel titles. 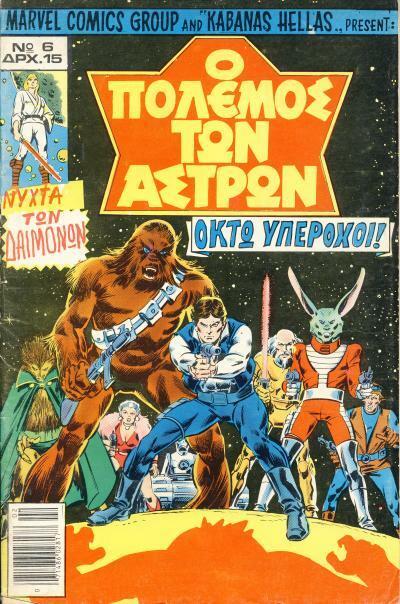 They published 9 issues total encompassing Marvel Star Wars #1 - 11. 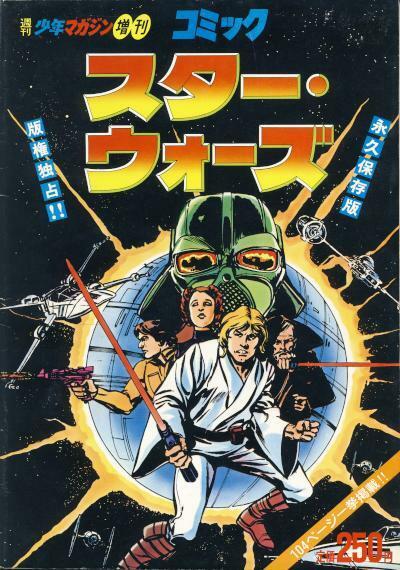 The comics are 52 pages and contain 3 or 4 stories with the lead story being Star Wars. Each issue contains alternating color and black/white spreads. The color palate is extremely limited with mostly blues, reds, and greens. Some of the color choices are strange. For example, in issue #9, one page has Princess Leia wearing a red dress and on another page the same dress is blue. The original material has Leia wearing the standard white dress she is seen in until the release of The Empire Strikes Back. The lettering on the covers is very amateurish. 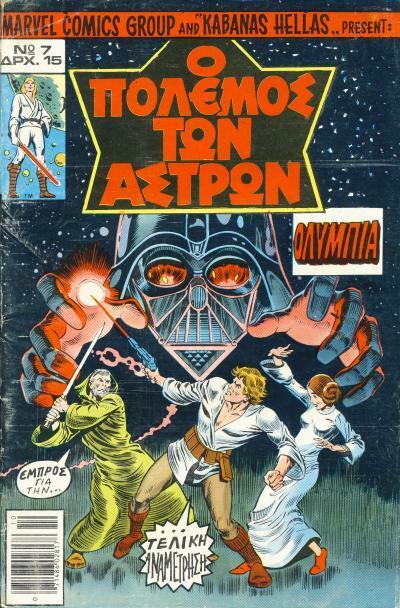 For example, the cover to issue #6 has the Greek word "NYXTA" which looks like it was pasted on the cover using a post it note. The original text in that box reads: "Extra! 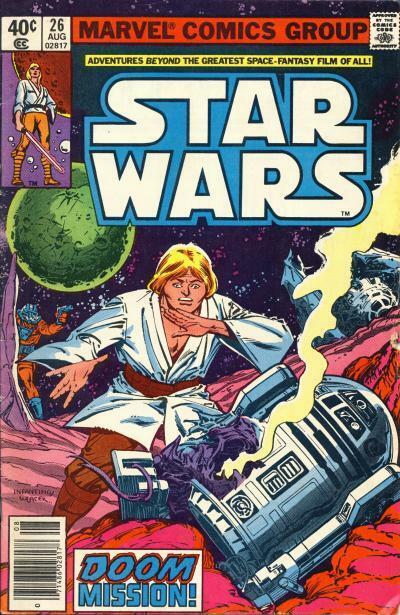 In this issue: The Deadly Mission of Luke Skywalker!" 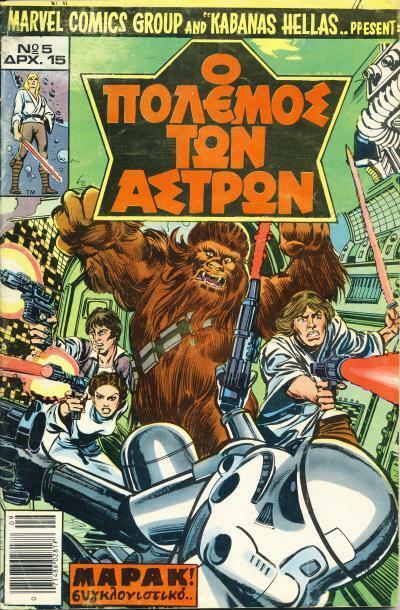 It appears the Greek translation says something else entirely. The back of issue #6 has an ad for the made for TV Spider-Man movie. 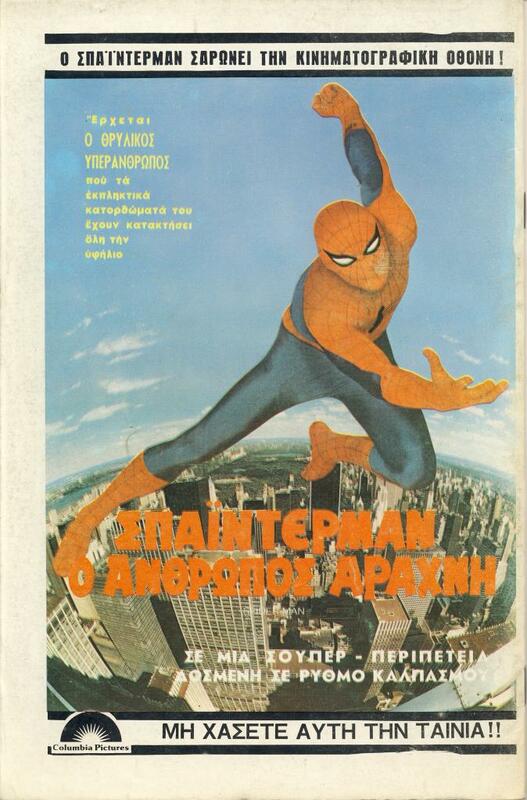 Was this movie released to theaters in Greece? 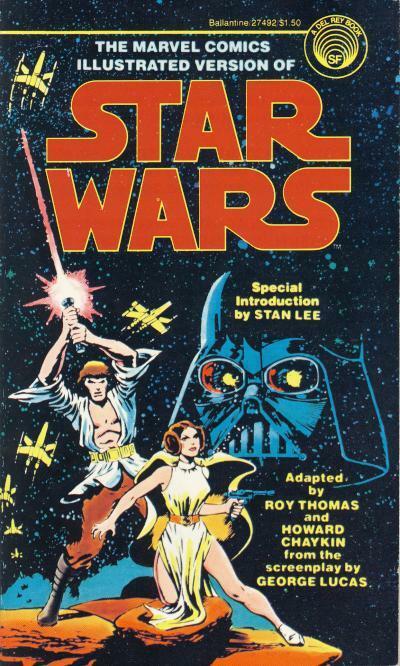 For as important as Yoda is to the Star Wars saga, he only made one cover appearance in the U.S. Marvel title. Yoda's only cover appearance on Star Wars #50 is about the size of a postage stamp, which is appropriate due to his diminutive size. For many, what is regarded as the first appearance of Boba Fett in comics depends greatly on what is consider a comic book. 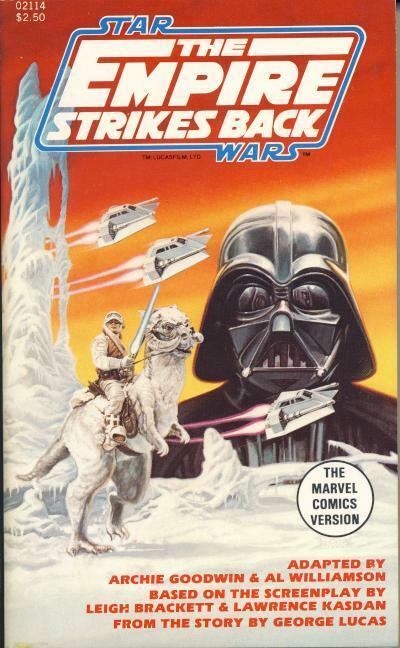 There are four different formats of The Empire Strikes Back comic adaptation: the traditional comic book or pamphlet which ran in the Star Wars title from issues #39 - 44, a magazine formatted Marvel Super Special #16, a treasury sized Marvel Special Edition #2: The Empire Strikes Back, and the paperback sized Marvel Comics Illustrated Version of the Empire Strikes Back. 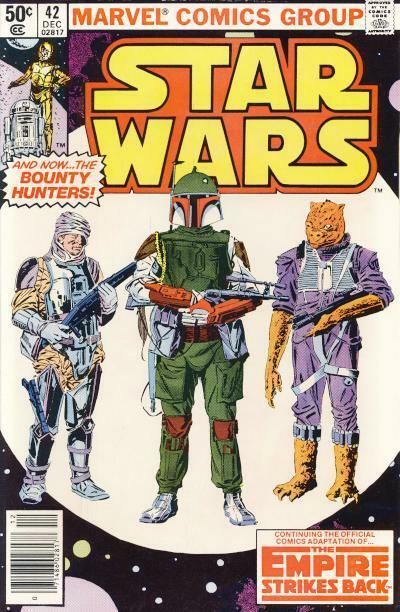 Boba Fett's first appearance in the traditional comic book format was in Star Wars #42. 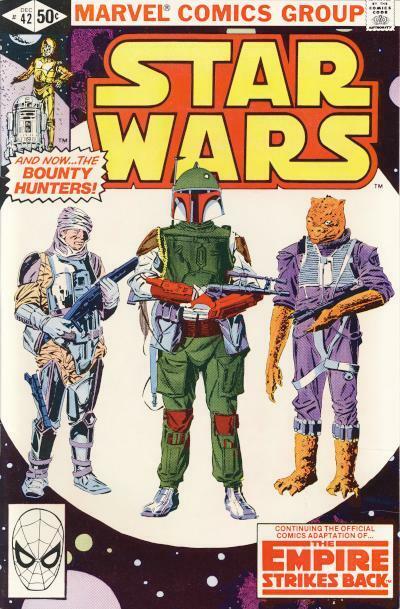 By the time this issue went on sale in September 1980, Marvel would have known about the popularity of the bounty hunter scene in the Empire Strikes Back and Boba Fett in particular, so it probably didn't take much discussion in-house for this cover to feature three of the bounty hunters from the movie with Boba Fett displayed prominently front and center. While Star Wars #42 has the distinction of being the first comic book format appearance of Boba Fett in the U.S., it is actually the 4th printing of the art used in the other 3 formats in the U.S. Marvel wanted to have the complete adaptation available around the time the movie came out, so Marvel published the other three formats in the spring of 1980 to coincide with the release of the movie. 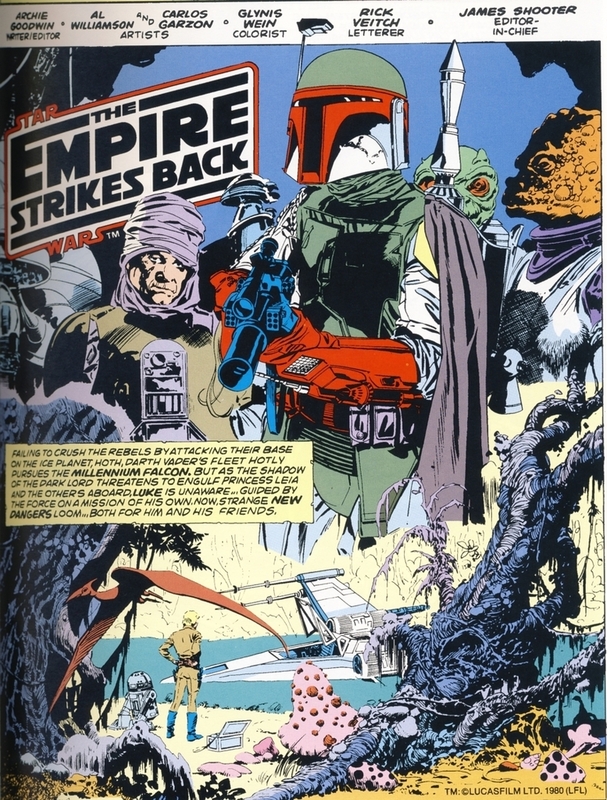 But one of these other three comic adaptation formats is notably different than the other two and has the distinction of containing the first printed art containing Boba Fett in comics, and that is the Marvel Comics Illustrated Version of the Empire Strikes Back published in May 1980. This format gets the distinction for being the first printed art because it contains an alternate Yoda depiction. The Yoda drawn in this paperback is based on a Ralph McQuarrie sketch which has a more gnome-like Yoda. This art was changed in the later publications to reflect Yoda's look in the movie. 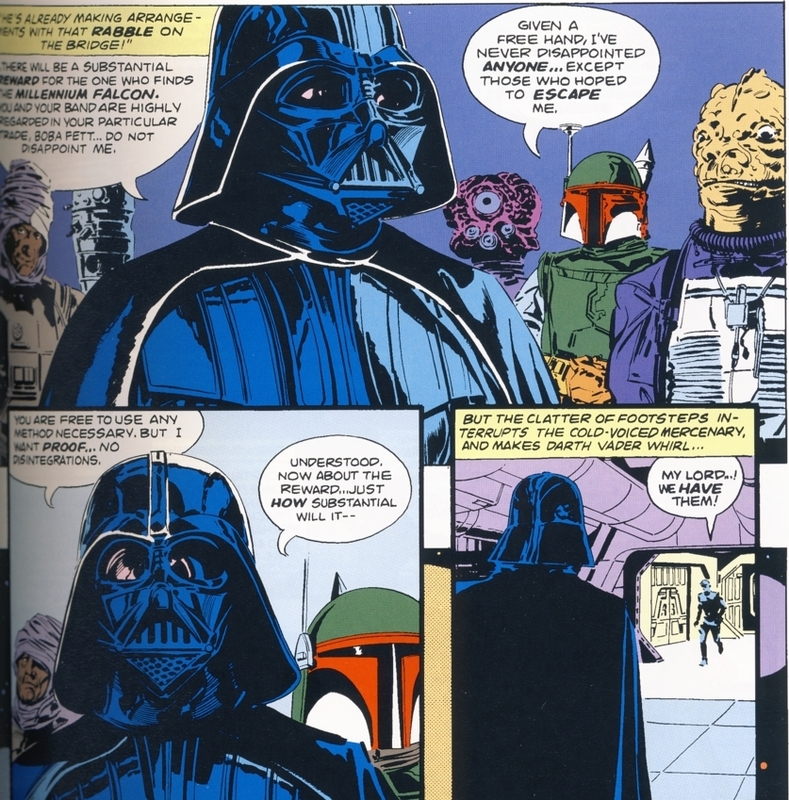 On the inside of Star Wars #42, Boba Fett appears on the splash page and in two panels on another page. He even speaks lines not in the movie. That is it as far as Boba Fett's appearance inside Star Wars #42! 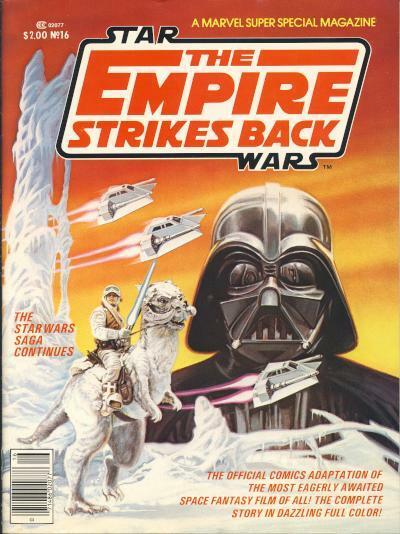 The Empire Strikes Back Weekly #129 contains the last 1/3rd of Star Wars #42 and features a Boba Fett cover. 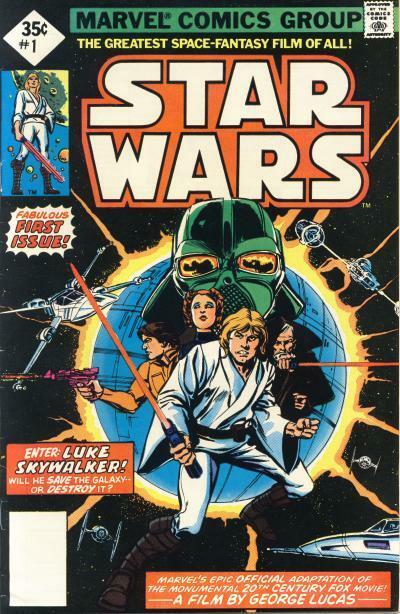 This U.K. publication has a cover date of August 14, 1980, which probably makes it the 1st Boba Fett cover. I would like to thank valiantman over on the CGC forums for this information. 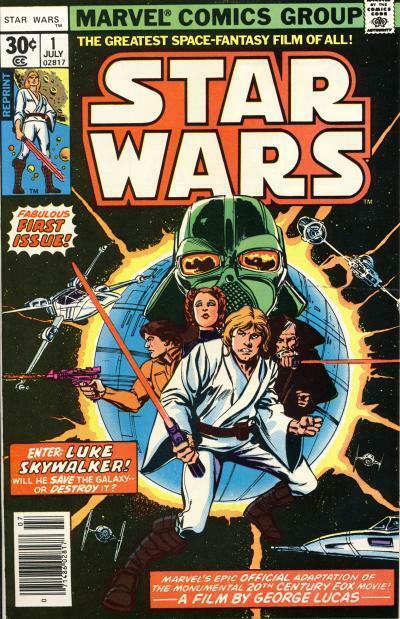 Marvel Comics Star Wars #1 has a cover date of July 1977 but went on sale in mid April 1977, over a month before the movie was released. Sales of the first issue were decent, but once the movie came out, the demand was so great for this comic book, Marvel went back to print several times in several different formats. 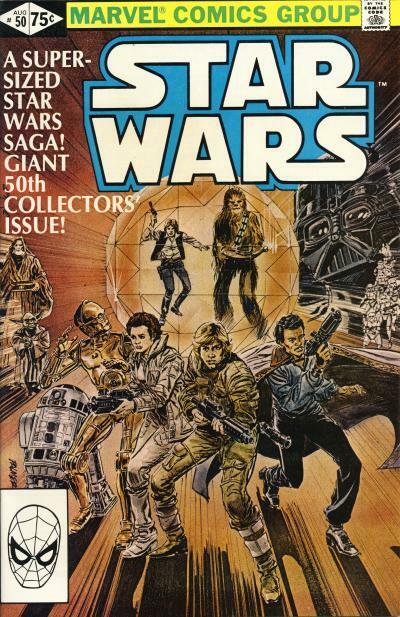 The various formats together sold over a million copies making those pages from that first issue one of the best selling comics in the 1970s. Star Wars is credited with saving Marvel Comics financially and provided a boost to the comic industry which was greatly needed. 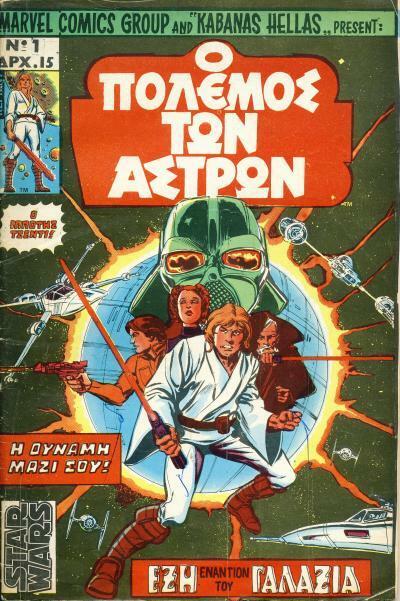 On the eve of Marvel's launch of new Star Wars comic titles in January 2015, I wanted a site to showcase Star Wars comics of the past and present, domestic and foreign. 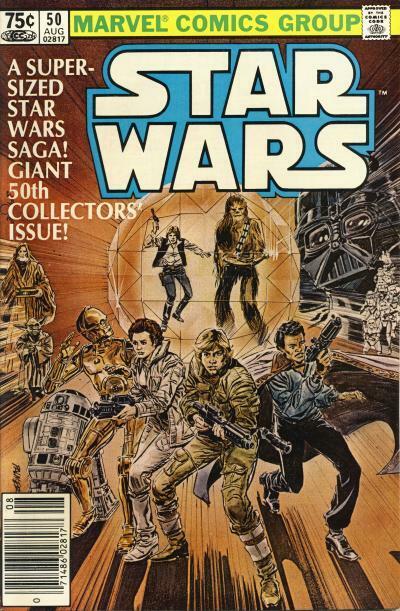 My hope is to attract other Star Wars comic collectors who are passionate about their collection and love the stories. I have been a comic collector for over 35 years. 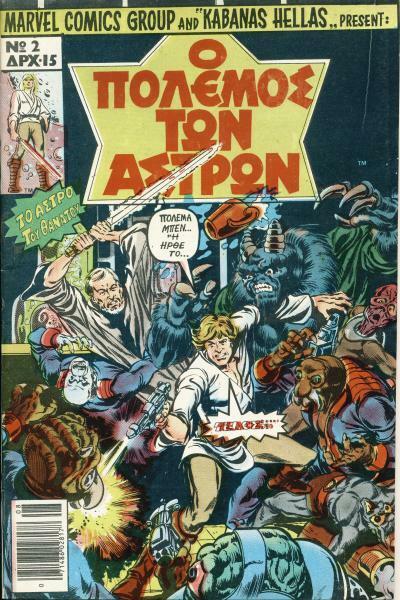 While I did have comics before Marvel Star Wars #26, I consider that comic the first comic book in my collection. 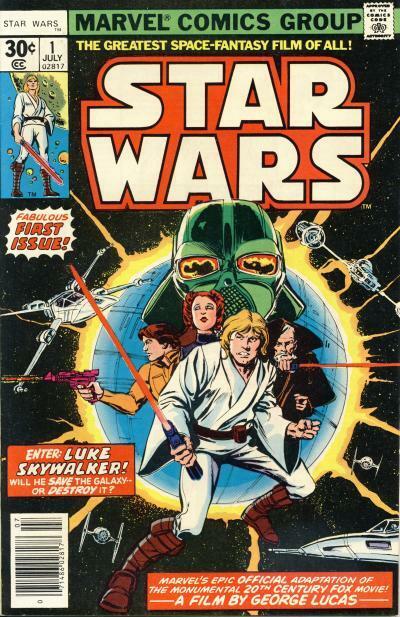 Star Wars #26 captured my imagination and started a collection which now contains 15,000+ comics, but the Star Wars titles have always held a special place for me. Like millions of kids in the 1970s, I was enthralled by Star Wars and like others, that first movie had a huge impact on my childhood. I was only 8 years old when Star Wars was unleashed upon the world. 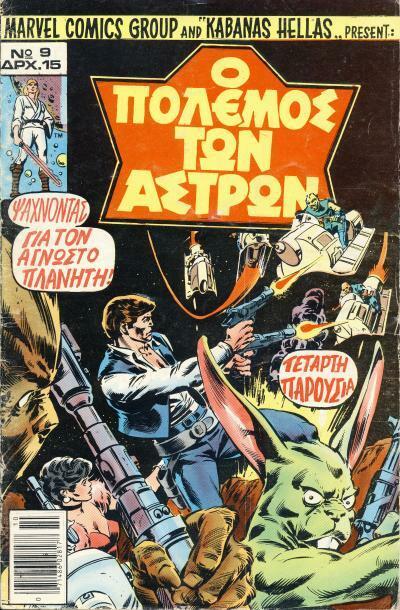 I spent many hours as a child playing with Kenner toys, speculating with my friends about the movie, role playing as Luke Skywalker or Han Solo, and yes, reading the comics. By the time the sequel, The Empire Strikes Back, came out, I was already a devoted fan of the franchise. My Star Wars comic collection has grown from the domestic Star Wars titles spanning Marvel and Dark Horse runs to include foreign printings of Marvel Star Wars comics. 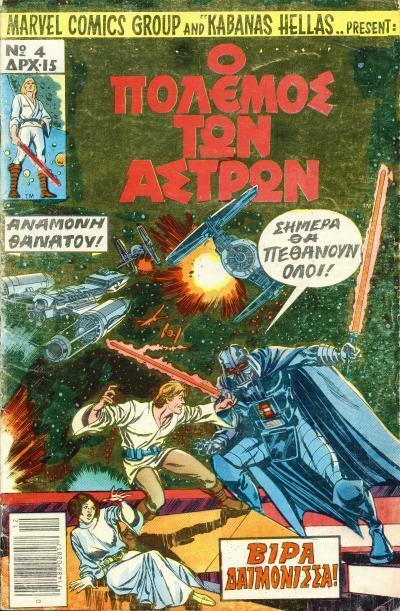 My goal is to own as many different Star Wars comics from as many different countries as possible. My devotion to the movies and comics never wavered; not when Marvel ceased publication in the 80s nor when the critically received first prequel, The Phantom Menace, was made. 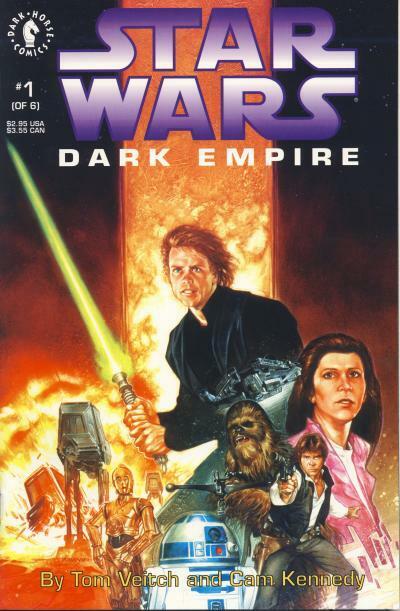 I was just as entertained by the prequels as I was for the new books published first by Bantam and then by Del Rey and by the new comic titles that Dark Horse had been publishing since the early 1990s. The prequels, books, and comics introduced new possibilities and situations to the expanding saga and I eagerly devoured everything that came out. Like the early 90s when Star Wars books and comics reintroduced us to that galaxy far, far away, it is an exciting time to be a Star Wars fan! The first half season of Star Wars Rebels has just completed on the Disney XD network. A new Star Wars movie is impending in the coming year. Marvel is launching new Star Wars comic titles. Unlike the 8 year old boy who was wide eyed and new to the concepts and characters, I am more familiar with this galaxy. I have spent years reading about the Jedi, the fringe underbelly that arose with the oppressive Galactic Empire, and the rebel fighters who fought to restore freedom to the galaxy. Like the 8 year old boy however, I am equally excited about the possibilities that exist in a continuation of the saga.